Range = 0-220 Deg Lenght = 400mm C/W Carry Case.. Range = 0-360 Deg Lenght = 600mm.. 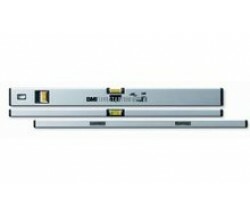 Double Plumb Spirit Level 1000mm / 40"
The Stabila 70-2 Series traditional light alloy box section spirit levels have smooth, rectangular p.. Double Plumb Spirit Level 1200mm / 48"
Double Plumb Spirit Level 900mm / 36"
Complete With Receiver , Staff, Tripod and Remote 8 - Functions Inc Inclines Max Distance = 350me..
Laser Wavelength - 635nm Horizontal Accuracy - +/- 0.5mm Range of Visible Line - 10 Meters Batter..
Level Magnetic Pocket Pro 7"
Stabila STBPOCKETBAS is a plastic basic mini format spirit level and is ideal for all horizontal mea..
Level Torpedo 3 Vial 8"
Extremely sturdy cast light alloy bodied level, withstands knocks and drops and is conveniently size..
Strong Hand 3 vials ofr 0, 45 & 90 deg levelling. Light & compact aluminium construction. 1/4" edg..
High impact shock proof level with a rigid aluminium frame and shock resistant rubber ends. Feature.. Precision milled measuring surface up to 120 cm provides maximum accuracy. Shock absorbing end ca..
Lightweight aluminium box profile fits easily into your tool belt or pocket. Solid acrylic vial. .. The Dewalt DW089KD is a 3 way Self-levelling cross line laser which is accurate to .. The Dewalt DEW088K is a 2 way self levelling cross line laser (Horizontal and Vertical) that is accu.. The DeWalt DW083K is a self levelling 3 beam laser powered by AA batteries. It is accurate to ..
Stabila 81 SV Magnetic Rare Earth torpedo levels as with Type 81S or 81SM but with additional angle ..